I’m continuing down my path to Spring with my latest project, How to Make a Spring Flower Arrangement in a Tool Box. This is the perfect arrangement for your dining room table, entry or to give as a gift. This post contains some affiliate links for your convenience. Click here to read my full disclosure policy. Start by cutting a piece of Styrofoam to fit inside the toolbox. Lay the sheet moss on top of the Styrofoam to cover it. If the moss spills over the Styrofoam a little that is fine, it can help make it look more natural and full. To help keep the moss in place, push floral picks into the Styrofoam in various places. Before placing the Styrofoam into the toolbox, put hot glue in the bottom of the box. Place the Styrofoam with the sheet moss on it in the toolbox on top of the hot glue and press down. Measure your flower stems against your tool box to determine where to cut them. Cutting them at an angle will help it go into the Styrofoam easier. Continue measuring, cutting and adding your flower stems until you have a nice full arrangement in the tool box. Note: Try grouping the flowers in certain areas to draw the eye in to your focal points. Make a single bow loop to place in the corner of the arrangement. For other instructions on bows, click here. I added a cute yellow bunny in the arrangement for some added interest. If your bunny doesn’t have a way to anchor it to the arrangement, you can add a pick to Styrofoam and attach the bunny to it. You can add some hot glue as well. Remember, sometimes you need to step back and look at all angles of your arrangement to decide if you need to add or move anything around. You want your arrangement to look beautiful from all sides! Even the back (see image below). I hope you enjoyed this How to Make a Simple Spring Flower Arrangement in a Toolbox tutorial. You could use this same technique with many other types of containers including baskets, crates, hat boxes and more. What kind of container do you have at home that would look good adorned with a Spring arrangement? 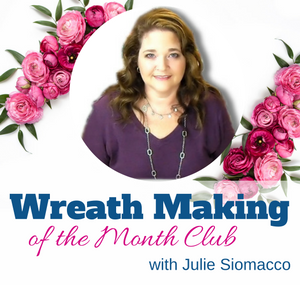 If you would like to join my wreath making of the month club, you can join here. all ready done the easter thing,would like to watch for the fall things that you do,,thanks you rose..